But NDTV Good Times thankfully has a lot of shows focused on Indian cooking, and cooking with ingredients that are easily available here. I was watching Guilt-Free, which showcases healthy recipes, and saw this recipe for whole grain crackers. I loved the store-cupboard nature of the recipe as well as how simple it was. Just oats, atta, sesame seeds, flax seeds and chilli flakes. Now I’ll make a confession- till I made these, I did not like flax seeds much. 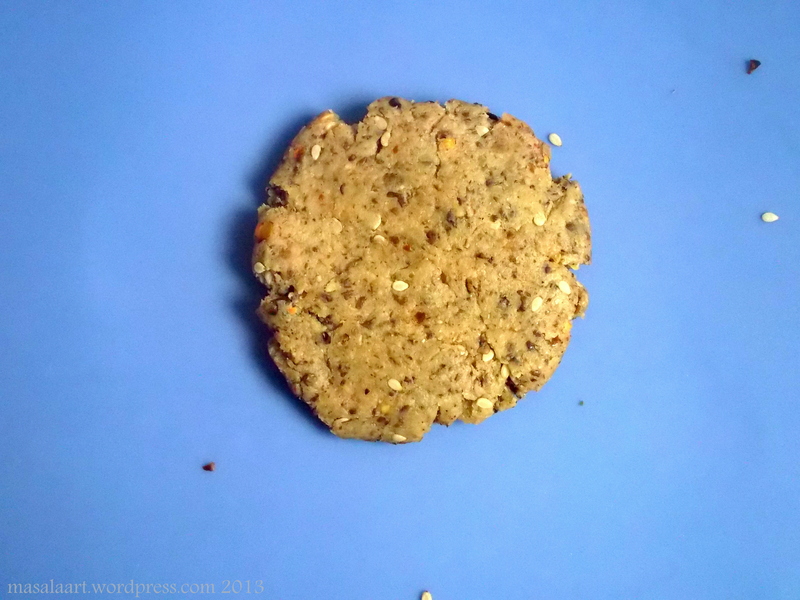 My first encounter with flax seeds was in the form of a brown rice and flax seed cookie, which I bought from a friend’s health food store when I was pregnant and had gestational diabetes. They were…well I do not like to use this word too much when it comes to food, but they were pretty disgusting. Strange waxy brown lumps interspersed with flax seeds which looked like bits of crushed beetle wings. The only way I can describe the taste is cardboard. My mom ended up eating the whole box because she did not want it to go to waste. 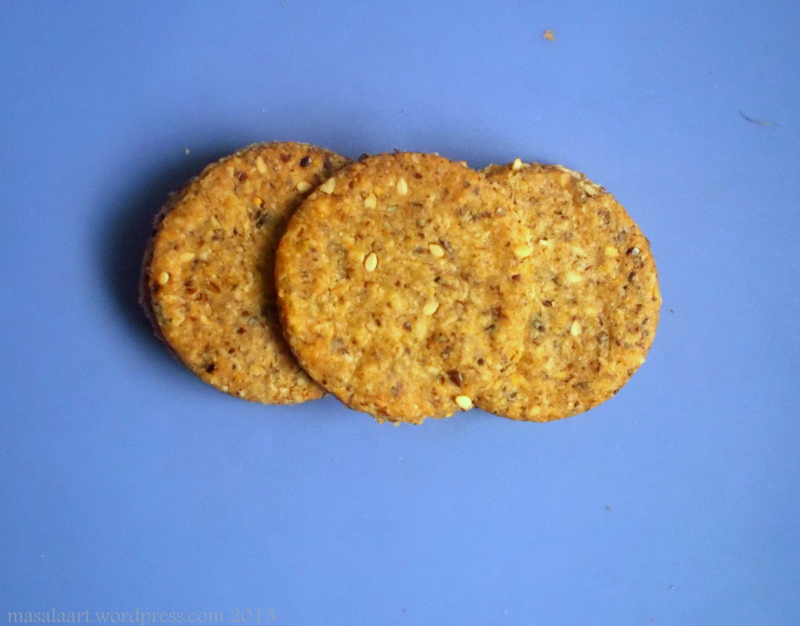 But the flax seeds tasted great in these crackers- crunchy, nutty and unctuous. I had to eat my own words! The recipe is pretty much the same as the one given on ndtvcooks.com; I just changed the amount of oil and sesame seeds. The dough looks and feels like chapati dough, just a little tougher and of course a shade darker due to the flax seeds. First, grind the oats and flaxseeds together in a blender and set aside. 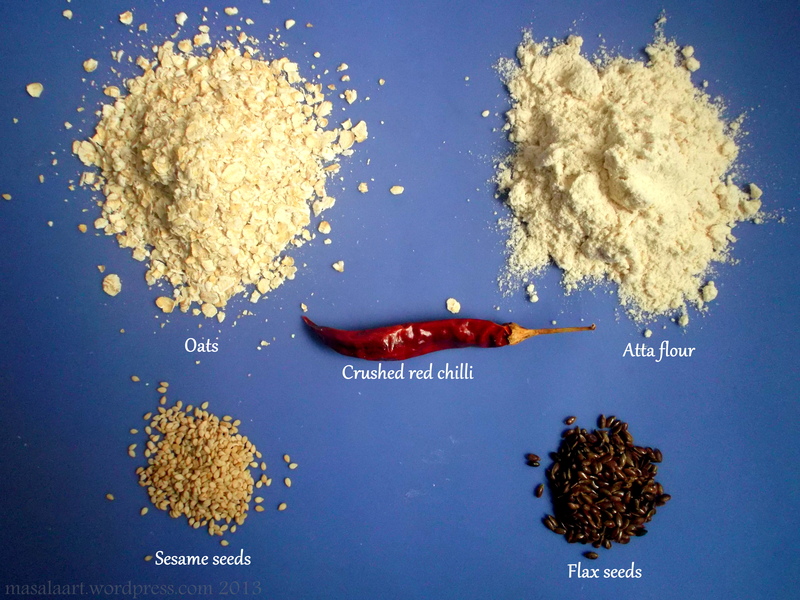 Next, mix all the dry ingredients together in a bowl- the atta, ground oats and flax seeds, sesame seeds, salt and red chilli flakes. Add oil, and a little chilled water to bring the dough together, till it becomes a ball. Use a cookie cutter to cut into circles, or use a knife to cut into squares or diamonds. Place on a baking tray and bake at 180C for 20-30 minutes. Crushed up beetle wings hahaha. I love these!! I think I will make them!!! I have to do a recipe swap today with a girl that doesn’t really like sweets (weird, right?) and I have been fretting over what to send her. These are perfect!!! What great, healthy looking crackers!